The James P. Mapp Building is seen above in 2012. NASHVILLE -- University of Tennessee at Chattanooga got the go-ahead Tuesday to move forward with repairs to the James R. Mapp Building in Chattanooga, a former state government office building given to the university after a state consultant said it wasn't worth fixing. With little comment, State Building Commission members approved the UTC's use of a previously approved $4 million to include additional work on replacing the building's roof as well as exterior work on the structure, built in 1992. The $4 million, first approved in 2014, also includes funding to make the former Chattanooga State Office Building, located nearby, suitable for "surge space" use. The money comes from $2 million in university reserve funds as well as an additional $2 million in Tennessee State School Board Authority bond issue in 2014. Right now, the major focus is on the James R. Mapp Building, located off McCallie Avenue. "The big expense is the roof," said Charles "Butch" Peccolo, the University of Tennessee system's treasurer and chief financial officer, following the State Building Commission meeting. "They have to replace the roof. But they're doing some wall relocations in order to make it more suitable." 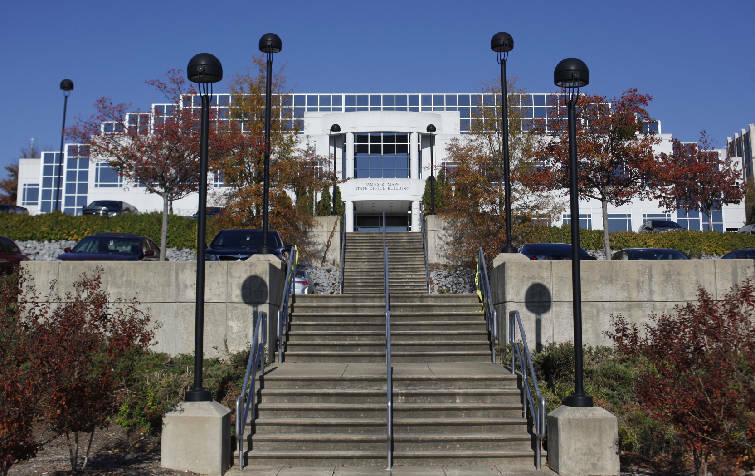 In 2013, Chicago real estate management firm Jones Lang LaSalle recommended the state get rid of six of its office buildings across Tennessee, including the James R. Mapp Building and Chattanooga State Office Building, because they were either structurally obsolete, too expensive to repair, or both. The Mapp Building was deemed too expensive to repair as well as heat and cool. Moreover, it had a structural issue in one section. The cost for fixing problems was pegged at about $3.5 million. The Chattanooga State Office Building, which was also given to UTC, was constructed in 1950 in the Art Moderne style as the headquarters of the Interstate Life Insurance company. Jones Lang LaSalle deemed the building functionally obsolete and not worth fixing at a projected cost of $8.49 million. In 2014, the National Trust for Historic Preservation put the Chattanooga State Office Building on its annual list of the nation's most endangered historic buildings. Gov. Bill Haslam's administration now contracts with Jones Lang LaSalle to run 33 state buildings across Tennessee and the administration is looking at a new round of outsourcing its real estate management and maintenance. But UTC, local governments and preservationists have a different sense of the worth of the some of the buildings than JLL had. Following an uproar by preservationists in Nashville, the governor was forced to reverse course on another building deemed functionally obsolete by JLL which the administration intended to raze. That was the historic Cordell Hull State Office Building across the street from the state Capitol. And the Donnelley J. Hill State Office Building in Memphis, also deemed functionally obsolete, was recently purchased from the state by the city of Memphis for $1.6 million. The city is embarking on a $6.2 million renovation the structure.